There I sat with a mass of tiny blank squares in front of me. I was supposed to chart the next motif on my Si’ira inspired wall hanging. 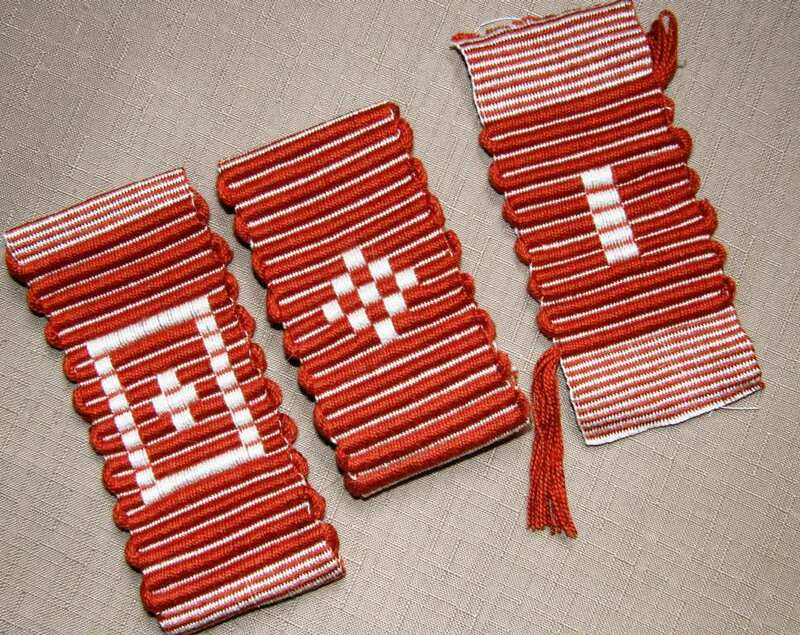 I want to use one of the motifs already charted in Mirja Wark’s book but make some adjustments and basically double its size so it will be bigger and bolder on my wall hanging. I don’t know why, I just couldn’t get motivated to start it. I knew very well that once the first few squares were filled I would be off and running and having fun but I put down the pencil and decided to roam a little online instead. And there it was…one of those delightful distractions. Someone revived an old thread in the Warped Weavers Group on Ravelry – the rep weave weave-along thread – and it reminded me that I had returned from my fall trip to the US with ideas about trying this on my backstrap loom. After all, it’s warp-faced and seemed like quite a natural thing for me to do. All that is required is the use of alternating thick and thin wefts. There is a very nice article here about the basics of rep weave. Some time ago, before I had ever heard of rep weave, I had played a little with this basic idea when doing simple warp floats. 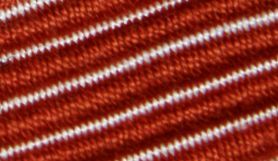 In an attempt to make the horizontal stripes less distracting on the band on the right I had used a #10 size weft under the white warps and a #3 under the colored ones. Obviously the difference in thickness wasn’t enough to be noticeable and I suppose if I had gone thicker, this piece would not have been practical for its intended use as a bookmark. And that is as far as I got with that. Color!! 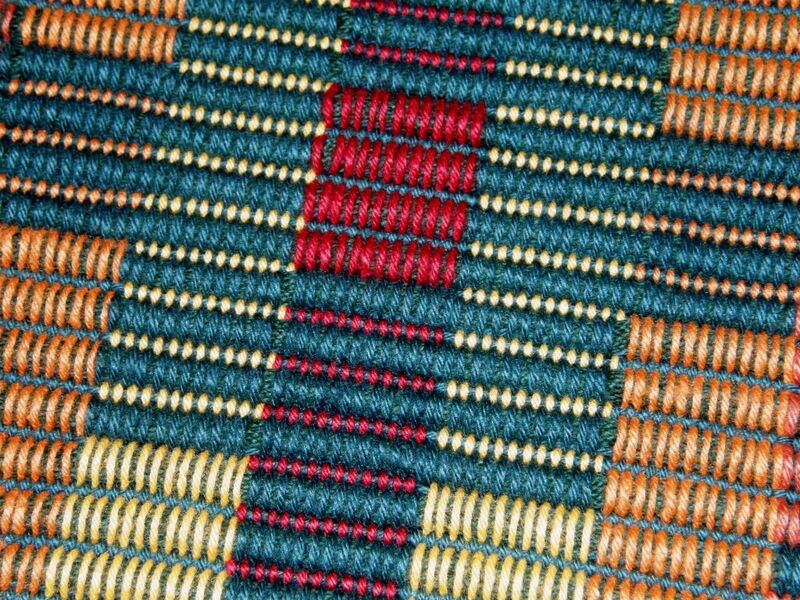 This was woven by The Mannings’ instructor Tom Knisely and made the front cover of Handwoven’s Jan /Feb 2011 issue, an issue that was near and dear to me because I had a little article in there myself. Little did I know that I would run into both the cover piece and its weaver in person. So what are you to do when there is no power and you are the guest of owners of a weaving store?….sit down with piles of back issues of Handwoven and enjoy! It seemed that almost every issue I picked up had rep weave in it or maybe it was just that my mind was now tuned into it. 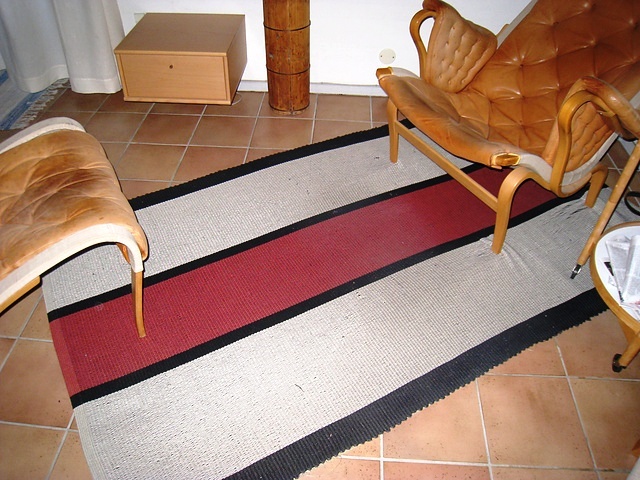 There was this gorgeous rep weave rug in one issue…. And it turns out that it was hanging right there in one of the rooms in The Mannings store. I had been far too occupied weaving to notice. So, I got to take a look at this one as well. 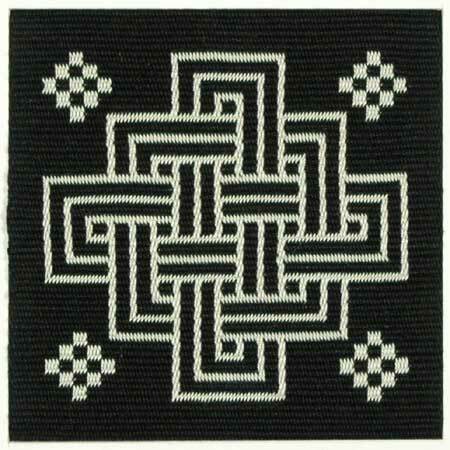 It was also woven by Tom. I learned that the warps don’t always have to be sett to completely cover the weft as they are in the first cover piece I showed above. 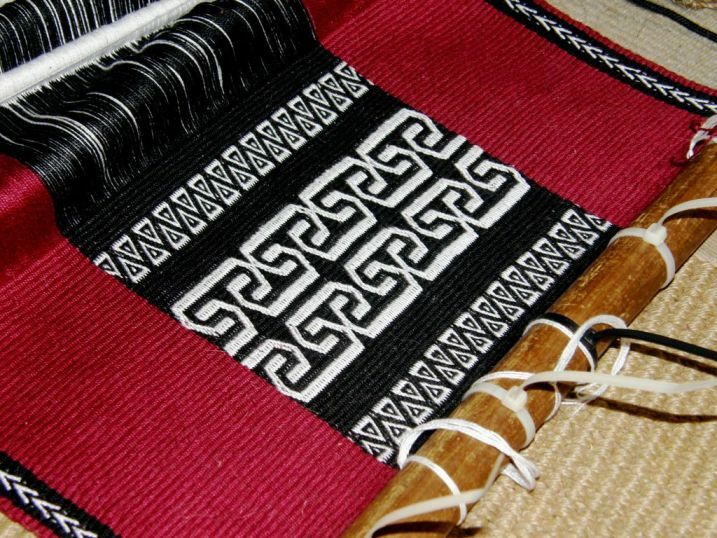 In this piece the weft can be seen a little between the warps. Of course you can’t even notice that from a distance. Perhaps this little bit of space helps you to achieve a clean shed more easily. Personally I like the more solid look. So, between Tom’s pieces and the articles I read in the magazines I came home with ideas which went onto the “to-do” list. I decided that now was a good time to try something in rep weave. I wasn’t in the mood for charting and just wanted to weave! I already knew the design I wanted to try and hooray, it didn’t need charting. First to sample…just how thick should that thick weft be? And what about the thin one? This is what worked with my Clea cotton (Clea is close to a #10 crochet cotton): I used sixteen strands of Clea for the thick and some tatting thread for the thin. The plain weave sections between the rep samples came up beautifully using the tatting thread as weft….no ridging and such pretty selvedges! A tip from one of the members in the Ravelry weave-along about finishing made me weave those plain weave sections. 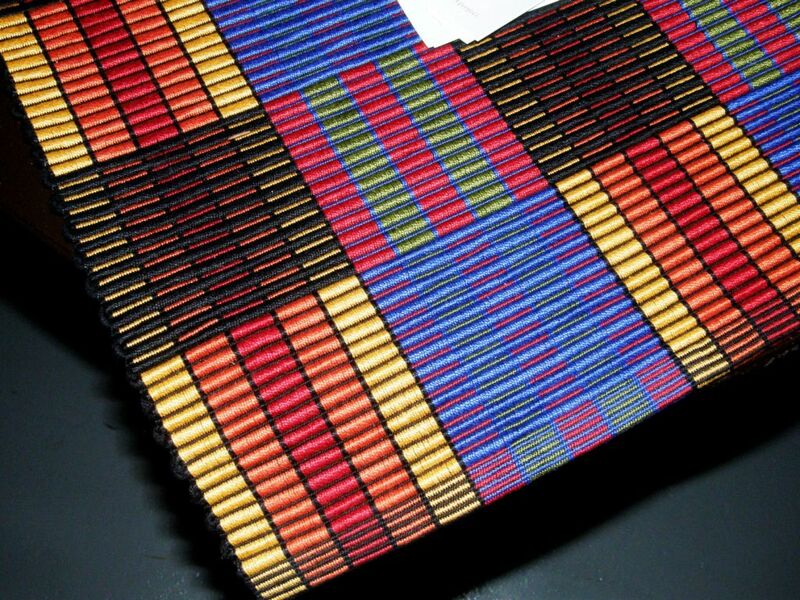 They can be folded under and hemmed and end up being pretty much the same thickness as the rep weave sections. And that takes care of those thick weft tails too. They can be concealed within the folds. The hemmed plain weave pieces can be folded partly or all the way under. In the picture above I have just folded them but haven’t yet sewn them into place. There were lots of nice tips on the weave-along thread. Some people finished their rep weave mug rugs with fringes. In that case I guess that the thick weft tails are somehow added to the fringe. Some people hem- stitched the ends. Here are a couple of the results of the weave-along. A lot of the participants were using a four-harness mug rug kit from Yarn Barn and this four-shaft one for placemats. Dawn MacFall hemmed her set of mug rugs while Donna finished hers with fringe. And it doesn’t have to always be about two alternating colors in the warp. 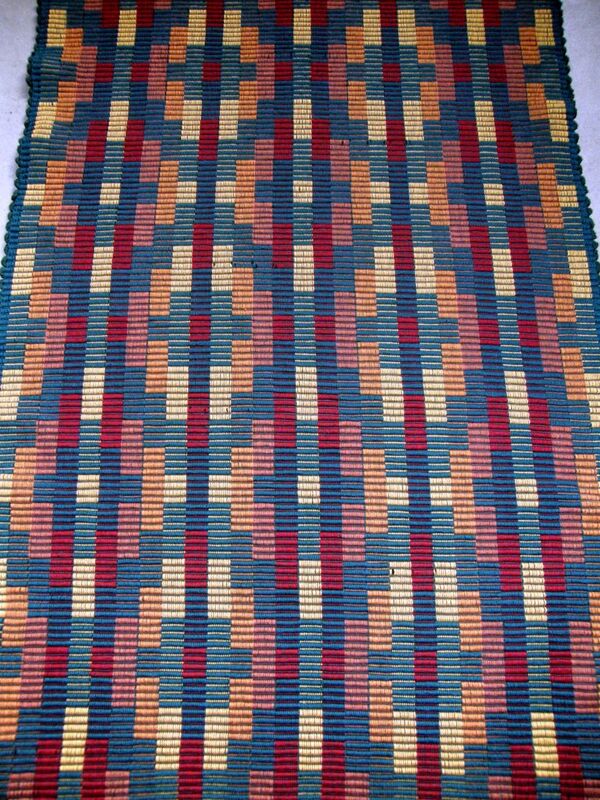 This rug made by Ellen Turner uses the same colors in both sheds….clean and simple! 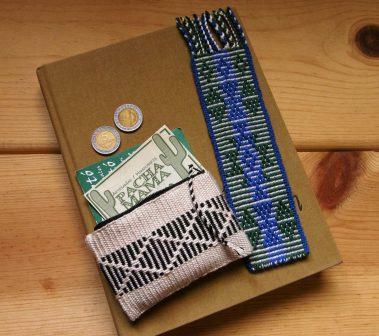 There were tips about handling the two shuttles of weft in the weave-along thread as well but, to be honest, the tip I liked the most was one by Tom Knisely in his Handwoven article (darn I didn’t write down the issue date). The article is called Getting Started with Warp Rep. 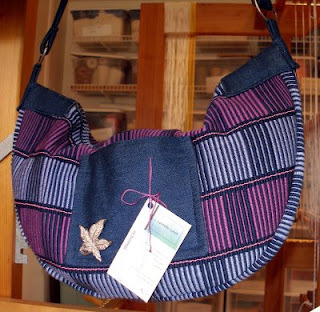 If you want to see some amazing bags made from rep weave fabric take a look here. I love these!! Lynnette, who created these gorgeous bags, has allowed me to post a picture here but please do go to her blog to see all the bags. Eva Stossel has some terrific designs for four and sixteen shafts on her blog here. So here I am once again admiring Marijke’s designs and wanting very much to do something with them. 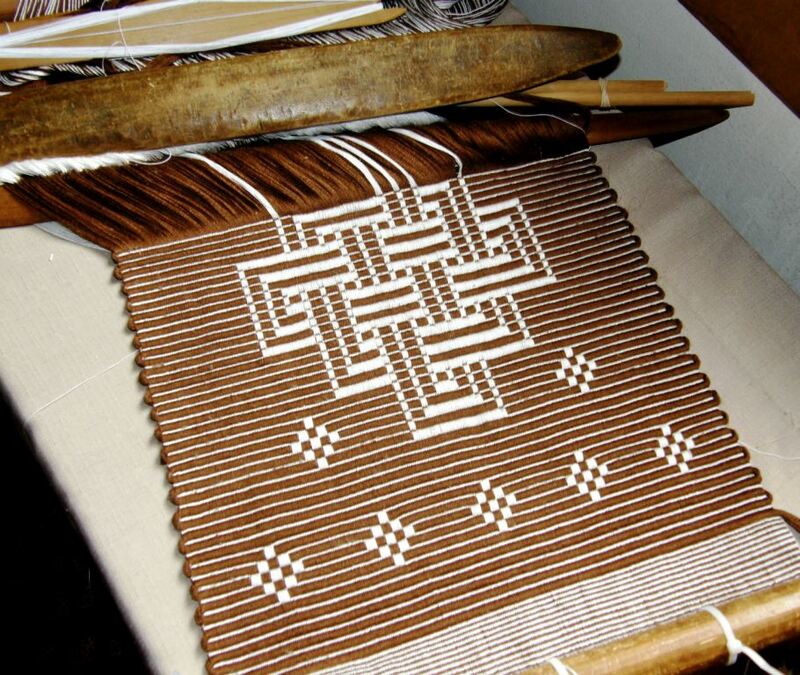 I could weave them in double weave like I did with the Abba Yohanni motif I wove below (which also happens to be on Marijke’s page) but I thought it might be fun and challenging to try one of them in rep.
What I have on the loom now I am calling a sample for a table runner. The brown yarn was the only color of which I had enough to make both warp and weft. The sixteen strands required for the thick weft chews up a lot of yarn. I used two sheds…the usual shed rod and string heddles and hand manipulated the warps to create the pattern. So, this is the sample. For the real piece I have an idea for a much more interesting border design and I will make those diamonds beside the main motif larger. I lost a tiny bit of width so I will make adjustments for that next time too. Once the first row of the main motif has been placed, there really isn’t any major counting to do and that is nice for a change. Also, can you imagine how fast this weaves up with that chunky weft?! My calculations of width to height worked out pretty well. If I had made the verticals in the motif wider to match the thickness of the horizontals the motif as a whole would not have turned out square. It was nice to return to Marijke’s site as she and I have been corresponding lately about a possible visit in September. I will be in the UK for the Braids 2012 conference in August and then plan to go over to The Netherlands. And I am secretly hoping to meet Mirja Wark somehow! So, this has been fun! Normally when I weave I can’t listen to music that has lyrics as I automatically want to sing along and all my pick-up counting goes out the window. So, I have enjoyed being able to weave and sing at the same time with this project. The B52’s Cosmic Thing album was my choice…no love songs, no broken hearts, nothing deep or analytical…just pure fun. One of my favorites is “Roam”. We used to sing that back in my ski bumming days in the 80’s when we literally would “roam around the world” following the snow. Now I roam around the world via the internet and the world comes to me too. 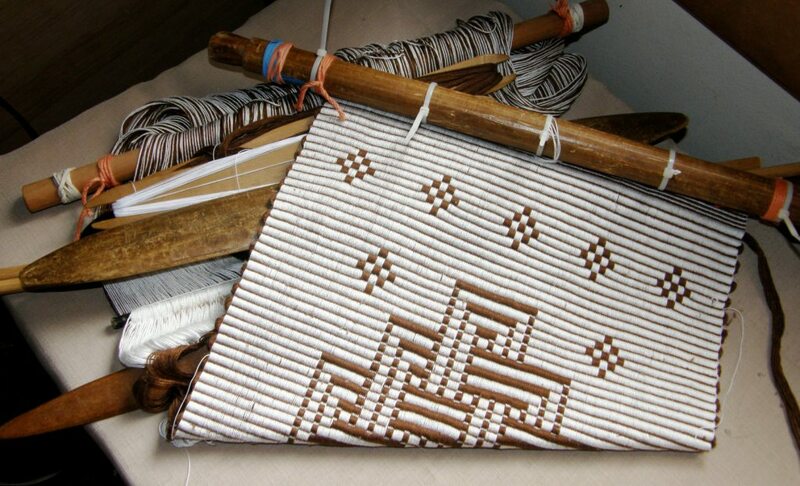 This week Greece paid a visit when Andreas sent me pictures of his latest backstrap weaving. My oh my, he has been getting on with it and brought me a cheerful splash of color. Color and all plain weave except for the one little pebble weave motif. I like the nice large shed rod he is using and the knitting needle heddle rod. There he is teasing me with the special shaped finish that he does so well. I must try that again some time. Sweden also dropped by in the shape of two beautiful books on Leksandsband that were sent as a gift. But it will be back to Colombia and Venezuela for me this coming week so I can get my design for the wall hanging ready. I will buy some yarn for the rep table runner and continue roaming the web for rep weave pattern ideas. Check out my RESOURCES page…I added a couple of new goodies. 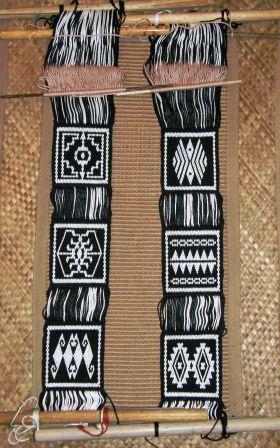 « Backstrap Weaving – Picking, Dropping, Counting,Twisting….Pattern! Thanks Jennifer. Your comments are always very much appreciated. Hello again. I’d like your opinion of my rep weave placemat experiment. My yarn is roughly 15 epi, and I’m going to try for the dimensions given for the Yarn Barn kit of 13.5 x 19. I’ve calculated for 285 ends and roughly 2 feet of warp, just in case. I’m also thinking of just doing solid vertical stripes, similar to those placemats, but much simpler. Would you just look this over and let me know if I’m on the right path? Also, should I warp and weave this project in one go, or is rep somewhat forgiving if I put it down for a day or two before weaving again? Have you woven a sample with your yarn? 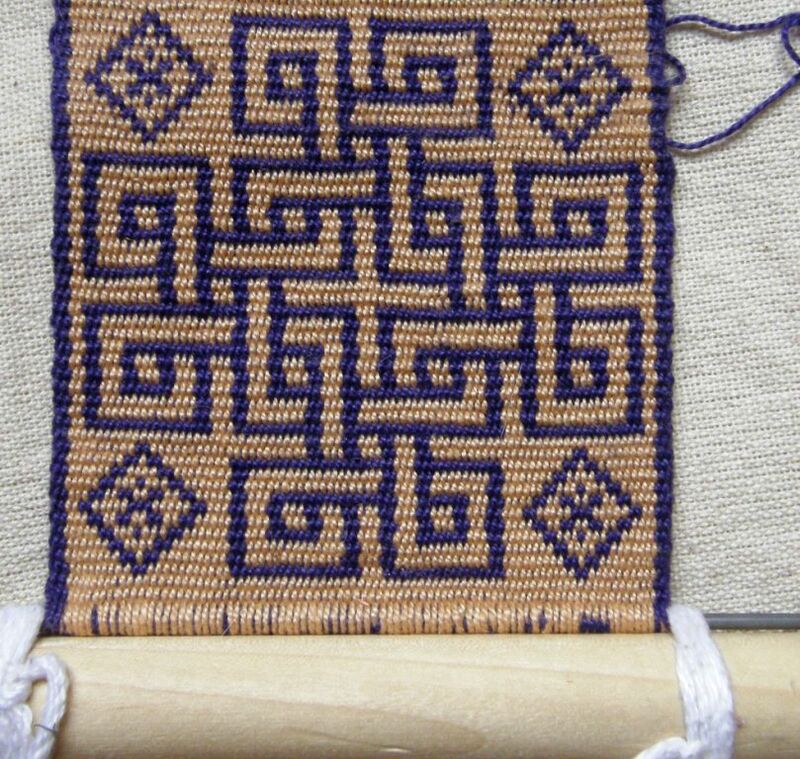 I am guessing that you got your epi figure from a woven sample of your own, in which case you should be able to make your width calculations based on that. I can’t advise you about what you can expect to lose in shrinkage after washing or take up. I really recommend asking these questions in the Warped Weavers group on Ravelry. You will receive many answers from experts there who are used to calculating for shrinkage. I rarely weave anything where the finished length and width are critical. Good luck with your project, Amanda. Thanks for the input, I’ll post it there too. I have what feels like a stupid question: are the sized for “weaving yarns” like 5/2, the same as crochet cotton sizes like size 5? 3/2 perle cotton and #3 crochet cotton are similar in girth but are different in construction. I haven’t actually found a #5 crochet cotton yet. Crochet cotton tends to have higher twist. Brands like Aunt Lydia’s are 3-ply while UKI perle weaving cotton is 2-ply.